One can almost imagine Bishan in its heyday. 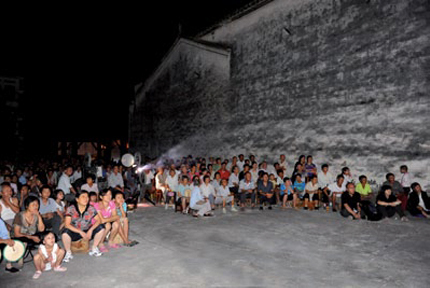 On the evening of August 26, 2011 the village’s daytime enthusiasm gushes towards the Yi County Cinema. It’s the kind of movie theater almost every small town has had, but Bishan’s has somehow managed to hang on to a 1980s or 90s feel. Above both the exits, in extremely serious-looking script, are the words “Emergency Exit.” Both the entrances are framed in brown wood, the left entrance for odd-numbered tickets, the right for even. On the white wall in between the entrances is a picture of Huangshan, the nearby “Yellow Mountain,” renowned for its scenery. Above it are the words “Thought Liberation, Conceptual Innovation.” Greenish-yellow lamplight floods the hall, which is full of men and women young and old chatting as they crack sunflower seeds. This “Harvestival” (a portmanteau of the words “harvest” and “festival”) has been heavily promoted, making it something of a not-to-be-missed event in the village. The woman sitting next to me mutters to her young son, “I would’ve brought your grandma if I’d known we didn’t need tickets.” Her name is Yang Xuemei. The hostess of tonight’s performance— which is called “Play It!”— is Han Yu, proprietress of a local guest house, the Pigsty Inn. 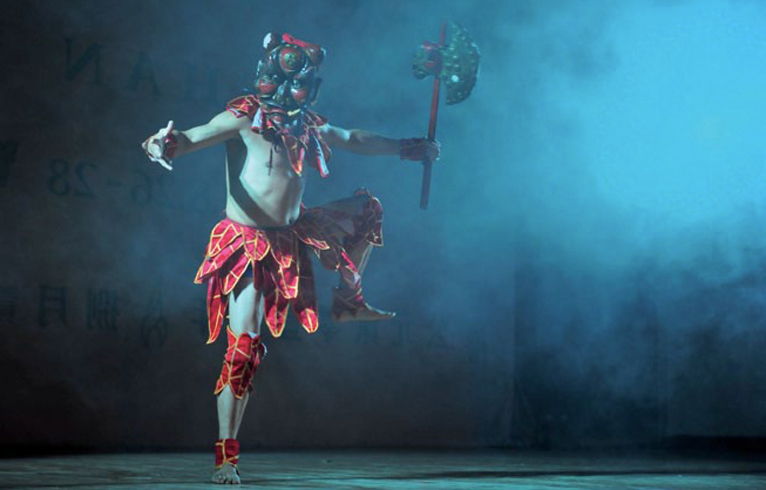 On the bill are several different varieties of traditional opera from Anhui and Hubei provinces. Many of the actors were invited by Yi County from nearby Qimen and Wuyuan counties. A few of them are from Anhui provincial troupes. The sound inside the theater could be better; but, truth be told, most of the crowd isn’t there for the show. It is only a few of the older souls in the audience who seem to have come for that, sitting as if on their own beds, rubbing the arches of their feet, their faces a mirror of the actors up on stage: one moment joyful, shattered the next. According to Yang Xuemei, it’s been a long time since the county has seen a commotion like this. Even though the theater was renovated once before— all the wooden chairs were swapped out for softer foam ones— usually it just sits empty, with a cartoon screening for the kids every now and then. The only big event as of late was an evening of patriotic songs for the Communist Party’s birthday party on July 1. Bishan is only an hour by car from Huangshan, and could rightly be considered the cradle of Anhui culture. The reason most people have heard of the area is the villages of Xidi and Hongcun, both on UNESCO’s World Heritage list. Yi County’s other historic villages— Bishan, Guanlu, Nanping, Taocun— usually get passed over by travelers. And any travelers who do go to the trouble to look beyond Xidi and Hongcun in search of a more authentic experience invariably find themselves greeted at the village temple by a ticket booth, then shuttled through a sanitized vision of village life. But where do they hide the real village? Zuo Jing, himself originally from nearby Jingde, felt the countryside calling him back long ago. He ended up buying a house in nearby Guanlu. At the same time Zuo’s good friend Ou Ning found his thoughts drifting country-ward. It could have been because of research he did in his native Guangdong, when he went in search of the roots of Asian urban development, finding possible answers inside a village in the heart of Guangzhou. He couldn’t be more against the form of rural travel so in vogue nowadays in China, which he dismisses as “like a dragonfly skimming across a pond, just checking places off on a list.” The idea that droves of travelers “never see the harsh reality of rural life… hardly ever lay eyes on anything worth getting angry over” pains him. The Harvestival featured a “staging ground,” a traditional Yi County folk ceremony where the bad are punished, the good are praised and congratulated, and blessings and peace are asked for the community and its people. The harvest totem in the background was designed by the artist Liang Shaoji. In China, rural reconstruction has a lengthy pedigree. In the 1920s, before the rise of treaty ports like Shanghai, the immense Chinese countryside lay quiet, unaware of the crisis of modernity about to break over it. From the giants of the last century, people like Y.C. James Yen and Liang Qichao, to contemporary reformers like Wen Tiejun, Qiu Jiansheng and He Huili today, no matter the particular ideas or methods, “awakening the minds of the people” has always been the foundation of rural reconstruction movements. Yen’s experiment in Hebei’s Ding County, for example, was an attempt to educate through the distribution of a “Peasants’ Newspaper.” But what use could art be in this effort? Mao Zedong’s “Talks at the Yan’an Forum on Literature and Art” set out the ways art could be mobilized in the service of politics and carried out into the countryside. But what of contemporary art, a rather recent development even in first-tier cities? Could it find acceptance out in the country? On the third and last day of the Bishan Harvestival, the documentary director Wu Wenguang is invited to present at a Bishan Project workshop titled “Paradox of Reality: Contemporary Documentaries on the Chinese Countryside.” The opera troupes have already packed up and shipped out, and the Wang family temple, hastily fixed up for the occasion, sits empty save for a few wooden stools surrounded with decorative ropes. In the courtyard there’s a lone harvest totem made from haystacks by the artist Liang Shaoji and Yang Xuemei’s father, Master Yao. Off to one side, a pair of granaries has been converted into exhibition spaces. Compared with the temple, their design is plain. Their designer, the architect Tang Keyang, has taken the essence of the “white box” style of exhibit, a style which positively reeks of 798, and given it a simple, straightforward shove. A handful of villagers and one non-resident stroll through the exhibit. A 70-year-old gentleman who goes by the surname Wang (the temple is his family’s) remarks that, although the space had almost gone to seed these few years past, when he was a child it was a paradise. One can envision a time when the Wang family temple and the Yi County Cinema were the village’s most important public spaces. Things are different now, though. Even though this is not a poor village by Chinese standards, there’s an obvious lack of public space, and nothing “cultural” enough for anyone to spend their money here. The village where Wu Wenguang is screening his projects is of an entirely different character. In 2008, Zhang Zhenyan and Hu Zhongquan (director Zhang Yimou’s longtime producer and set-dresser, respectively) began to work together to create what they call “Landscapes Reborn.” Their creation is a six-and-a-half hectare village, complete with old Huizhou-style streets, rivers running through town, a refurbished temple, and 60 irreparably dilapidated residences teetering on the brink of collapse. It is the very picture of a traditional southern Anhui Huizhou village. Most of the time, it is also a ticketed tourist attraction. Upon entering, the Taiwanese architect Hsieh Ying-chun and the woodblock artist Liu Qingyuan couldn’t help remarking how “surreal” the whole thing was. So in 2005, after much consideration, he was able through his “Villager Documentary Project” to move from the “artistic behavior” he had been accustomed to before to a more concrete kind of praxis. Another project of his begun five years later, the “Folk Memory Project,” was a continuation and expansion of his earlier work, with an enlarged roll of participants. Wu himself returned to the village in Yunnan where he’d been sent as a young man, interviewing the older villages there, filming their recollections of the famine. “The historical documentation of one village’s memories is prime archival material. The filming process resulted in one documentary and some theatrical works; perhaps the spiritual wealth of something like memory leads to reflection on the focus on rural reconstruction,” says Wu. “Nostalgia on Screen: Early Films on the Chinese Countryside,” held in Granary No.1, attracted a considerable number of villagers. In their Bishan Project, Ou Ning and Zuo Jing have had to confront head-on the same problems as Wu Wenguang. To make sure that their project was “fully articulated,” Zuo immersed himself in the details of a traditional harvest festival. 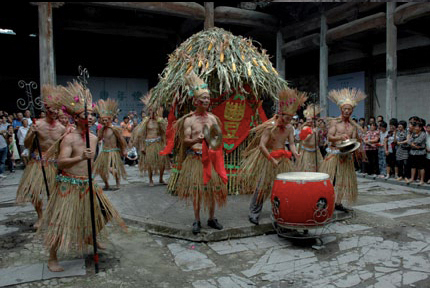 Their festival featured a “staging ground,” in reality not a place but a traditional Yi County folk ceremony where the bad are punished, the good are praised and congratulated, and blessings and peace are asked for the community and its people. For all that, the Harvestival, with its themed exhibitions, its Yi County handicrafts, its temple fairs, academic symposiums, outdoor movie screenings, and concerts by rural youth, still carried the distinct whiff of the urban intellectual, of an art exhibition model carried in from the outside. One could be forgiven for wondering if it was supposed to be art, or rural reconstruction? And if it was, in fact, rural reconstruction, then who exactly was its subject? Before the Bishan Project’s inception, Ou Ning had already made rounds of the Mainland, Taiwan, and Thailand (see LEAP 8, “Reluctantly Re-Reading the Land”) towards establishing close relationships with groups and individuals working on rural reconstruction. As a result, what could rightly be called an all-star intellectual lineup— including Zhong Yong-feng, Hsu Lan-hsiang, Wu Yin-ning, Hsieh Ying-chun, and Wang Mo-lin from Taiwan, as well as He Huili, Lü Xinyu, Liang Hong, and Hu Xiangcheng from the Mainland— converged on Bishan for three academic panels, including the discussion “Rural China,” which touched upon rural reconstruction and the preservation of regional histories and cultures. He Huili, assistant to the mayor of the city of Kaifeng, brought six cadres from her home province of Henan to Bishan, organizing a number of discussions with artists, academics, and intellectuals, emphasizing the need to put ideas from afar to use at home. In the inaugural issue of the literary magazine Chutzpah (full disclosure: Chutzpah is also published by LEAP’s parent company, Modern Media), founding editor-in-chief Ou Ning wrote, “The impression I got from The Land Project was that it felt very much like a closed and isolated Utopia— its main body of action limited to artists and art students, with only a weak connection to the communities around it.” He described the project ultimately as little more than “a contemporary art enclave.” Perhaps as a result, Ou was on guard against attempts by the local government to turn the Bishan Project into a tourist attraction. At the same time though, to garner support of the local government, he had to demonstrate his empathy for the urgency of the situation it confronted; namely, a lack of the industrial base needed to push development forward. Zuo Jing felt that, overall, cooperation with the local government was “not bad,” but that “at the lowest level, down at the village, there wasn’t enough communication between the two sides.” Consequently, the Bishan Project also showed signs of being only weakly connected to its host community. So the project could maintain its independence, Ou Ning stressed the need for operations to be non-profit. Raising the necessary funds, however, has not been easy; at the moment, the larger part of the festival’s operating budget still comes from within the art system Ou and Zuo are so familiar with. Of course, it is not our intent to circumscribe the Bishan Project; it has only just begun. Time is needed to think it through, to refine it. That we should expend so much effort in following its development is a testament to the contributions its two creators have made to contemporary art. Chinese contemporary art is becoming increasingly aligned with the outside, seeking solutions to a countless number of complex problems. Perhaps it is now time for rural reconstruction to resume its place as a new theoretical and applied field of study. At the very least, the Bishan Project has made clear its intent to break with convention on its own terms, and to take bold, innovative action.